Everything that proves Chartez Tucker exists fits in a plastic grocery bag. There’s a wadded-up photocopy of his expired Michigan identification card. Some pieces of mail that look like they’ve been through the wash. A few pieces of this-and-that to try to authenticate his 45 years on Earth. “Right now, he’s a John Doe. A nobody,” says his sister, Jacqueline Tucker. Her brother cuts her off. The two were recently at a social services agency on Detroit’s east side to begin the process of acquiring a state ID so he can get an apartment. But the process can take six months and unfold through a series of fits, starts and bureaucratic walls that reveals the everyday hassle of being poor. For Tucker, it means bus trips, long waits in government offices and cobbling together money for copies of his birth certificate, academic and other records. He lost his ID with his wallet four years ago. When he talked to Bridge last month, Tucker had been to the Social Security office four times without luck. “They make it so hard,” said Tucker, who lives with his mother, doesn’t work and suffers from seizures. Lacking identification is a surprisingly common problem, particularly in cities: As many as 1 in 10 Americans don’t have a government-issued ID, according to the Brennan Center for Justice at the New York University School of Law. Other studies claim as many as 13 percent of African-Americans lack IDs. It’s an issue that’s both practical and political. Fears of voter fraud, terrorism and identity theft have many government officials reluctant to ease requirements to get IDs to vote; requirements that increased significantly after the 2001 terror attacks. The push has come predominantly from conservative lawmakers, raising accusations among progressives that Republicans’ real goal is to suppress election turnout of black and Hispanic voters, who tend to vote Democratic. A 2015 report by Project Vote, a Washington D.C.-based nonprofit aimed at mobilizing marginalized voters, found laws requiring photo ID to vote unfairly disenfranchise poor and minority voters. Here’s who the study says lacks ID nationwide. 12 percent of adults with household incomes of less than $25,000. Nationwide, 34 states have laws requiring voters to show IDs to cast ballots. A bill to make it tougher to vote in Republican-controlled Michigan without ID passed the state House in December, but stalled in the Senate. But those who work with the poor say IDs have value beyond the voting booth ‒ they are the first step to escaping deep poverty and unlocking basic amenities. Getting a job. Opening a bank account. Signing a lease. Applying for government benefits. Sometimes even going to a homeless shelter. All require ID. Those without one face something of a Zen riddle: How do you prove you exist if you can’t prove you exist? “You need ID to get ID,” said Greg Markus, a professor emeritus of political science at the University of Michigan and an organizer with Detroit Action Commonwealth, a social services agency which guides about 25 people per week through the process of getting IDs, including Tucker. For Tucker, it starts with Detroit Action Commonwealth, where volunteers help him form a plan to get paperwork for an ID. One month later, he is still waiting. Government officials say there are good reasons why getting an ID shouldn’t be easy: terrorism and security. Requirements vary by states, but most typically require multiple pieces of documentation for driver licenses or state IDs. The 2005 federal Real ID Act, passed in reaction to the 2001 terror attacks, requires minimum state standards. In Michigan, people need four types of paperwork for a state ID: A Social Security card, W-2 or paystub with the number on it; a birth certificate or passport; identity verification such as school records or marriage or divorce records; and two pieces to prove residence, such as a utility bill, bank statement or rental agreement. No records are available in Michigan on the number of adult residents who lack ID. In fact, there are more total driver licenses (7.2 million) and state-issued IDs (1.05 million) than there are residents over the age of 14 (7.9 million), according to the Michigan Secretary of State and U.S. Census records. Woodhams said those numbers include overlap from those with suspended licenses who get state ID cards. Also, the numbers include those who moved from Michigan but still have licenses, a common occurrence. The issue is believed to be particularly acute for the homeless in Michigan, which the Michigan Campaign to End Homelessness estimates total 40,000. A 2004 report by the National Law Center on Homelessness & Poverty found that roughly 50 percent of homeless people were denied federal disability benefits, food stamps or access to shelter because they lacked ID. “You’ll be surprised how many people are out there on the street and get a backpack stolen with ID in it, and how that can turn your life upside down,” said Vic Modin, 69, of Detroit. Modin said he got by working odd jobs and riding a bicycle after his driver license expired more than 10 years ago. He said he didn’t have a bank account, and wanted an ID to bid on property at the Wayne County tax foreclosure auction. The ID process took about a year. When he started, Modin lacked a birth certificate and Social Security card. That meant he couldn’t apply for Social Security retirement benefits. “This is what is called a poverty trap,” said Markus of the Detroit Action Commonwealth, who helped Modin. Besides basic amenities, lacking an ID also can close the door to voting in many states. Some studies, such as one in 2015 by the Project Vote nonprofit, and a more recent study by the University of California San Diego, found that laws requiring voters to present IDs depress votes in poor and minority communities. Other scholars including New York University Law Professor Richard A. Epstein disagree. He contends racism fears are unfounded and that states without strict voting laws actually encourage minorities not to get IDs. “The fraud problem is systematically underrated,” said Epstein, who has studied the issue extensively as a senior fellow for the conservative-leaning Hoover Institution at Stanford University. Michigan doesn’t require registered voters to show IDs before casting ballots. Those without one must sign affidavits attesting to their identity. A bill last year would have required those without IDs to fill out a provisional ballot, which would only be counted if the voter returned to the clerk’s office within 10 days to show photo ID. The measure, which died in the Senate, was sponsored by former GOP state Rep. Lisa Posthumus Lyons, who is now Kent County clerk. “Presenting your ID is the most important way to protect everyone’s vote, by proving you are who you say you are. The people deserve to know that,” she told Bridge. A similar argument is behind President Trump’s controversial commission to root out voter fraud, which was based on the president’s unproven claim that he lost the 2016 popular vote only because millions of non-citizens voted illegally. Epstein and others argue that a lack of criminal convictions for voter fraud doesn’t mean it doesn’t happen. He points to last year’s election in New Hampshire, which is one of 15 states that allow voters to register on the same day as the election. The election, which narrowly elevated Democrat Maggie Hassan to the Senate, included some 6,200 voters who registered on election day. Trump has said there was “serious voter fraud” in New Hampshire, and his elections panel held its first public meeting there this month. New Hampshire officials respond that critics offered no proof of fraud and don’t understand the state’s voting laws. Getting an ID is so complicated most people “can’t do it alone,” said Pat Rodenhouse, a part-time employee with Degage Ministries in Grand Rapids, which has helped about 500 people a year get ID since 2001. One of the four types of records required to get an ID, for instance, is proof of identity beyond a Social Security card or birth certificate – things like official copies of marriage licenses or divorce decrees, adoption records, prisoner IDs, tribal IDs or school records. School records are typically the easiest to get, Markus said. In Detroit, that means a bus trip to a far-flung Detroit Public Community Schools office that charges $5 for records. The office doesn’t accept cash, personal checks or charge cards. It only takes money orders, which are sold nearby at a post office for $1.20. And to get the transcripts, of course, you need to show an ID. Groups that help those without ID overcome the obstacles by working closely with county officials to obtain documents such as birth certificates, driving groups to government offices and establishing paper trails necessary to secure other documents. In some cases, those without documents can get an exemption from records or fees. The first step often involves registering to vote, which doesn’t require an ID in Michigan. Municipalities are recognizing the problem. 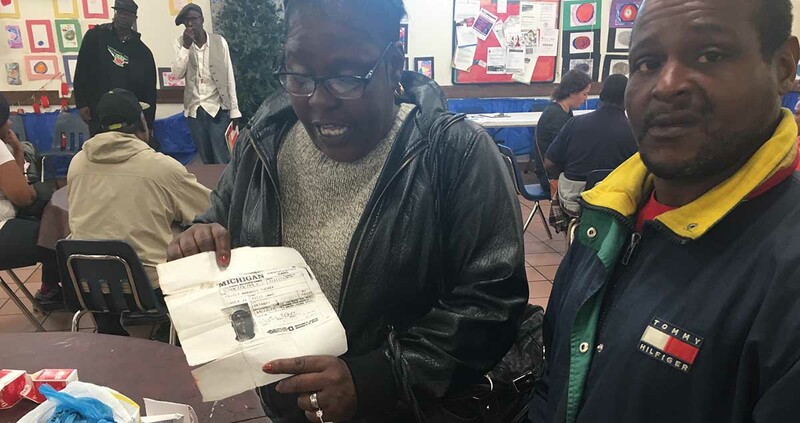 Detroit last year joined cities such as Newark, New York City, Oakland and San Francisco to introduce municipal identification cards to those without them, including undocumented residents. Detroit has issued about 3,000 cards, which can be used to access services from the health, water and police departments and land bank. The card is also accepted by some credit unions and hospitals. Nationwide, states from Hawaii and Texas to Massachusetts and West Virginia have introduced legislation to eliminate some paperwork and make it easier for the homeless to get IDs. Reform proposals including eliminating fees on birth certificates and allowing the homeless to sign affidavits of their identity to satisfy some of authentication requirements. In Grand Rapids last week, dozens of residents applied for IDs at a Secretary of State office with the help of another Degage employee. It was the culmination of a process that can take months, tracking down paperwork such as missing birth certificates, marriage licenses or school records. The group included Bobie Ball, 62, of Grand Rapids, who said her ID was stolen several years ago at a bar. Three months ago, she said, she was denied disability payments because she had no ID. Ball had no idea how to secure the birth certificate she would need to get a new ID. Rodenhouse contacted officials in Ball’s birth county in Illinois, then in the state capital of Springfield. Because Ball had no photo ID the state would accept, Rodenhouse finally secured it by submitting her own identification and a notarized letter from Ball requesting the document. Ball should have an ID in a couple of weeks. “I’m going to hang on to it this time,” Ball said. This article hits the target. Everything in the article rings true. I helped a homeless person to get a state ID and it took more than two months. If I hadn't driven him around, I doubt it would have happened. There's a Catch-22 at every turn. To top it all off, the State of Michigan contracts with a company in Georgia to produce the State ID card and there's yet another 30 day wait for the card after all documents have been accepted by the SOS office. The worst problem was that he had health insurance, needed prescriptions for medicine, but doctors' offices would insist he pay cash since he had no State ID . Welcome to the emergency room. I've no idea what the appropriate balance is between competing goals (preventing identity theft, preventing terrorism) and getting people the ID they need as quickly as possible so that they can survive and lead a normal life. Cynically, I'd think that the Snyder administration's message about "fiscal responsibility" has resulted in a state bureaucracy that is less than proactive in efforts to help those in Michigan who are struggling and in need. You've got problems? Don't turn to state government for help. If the person you were assisting started with no birth certificate, no Social Security card, had never had a driver's license or state ID issued in the US, had never served in the military or previously registered to vote, then getting an official ID for that person in only 2 months was a great feat. Michigan's requirements to issue a state ID have been sufficiently lax that our ordinary (non-enhanced) ID / driver's license won't be accepted for air travel or to enter Federal buildings after late 2018 under the Real ID Act. First, I agree that all governmental agencies need to strive for providing services efficiently with cost effectiveness for the taxpayer. Second, in the examples listed in the article, there is a level of personal responsibility that plays a role. These guys seem very smart and should know they should always have an ID or ID copy left with a family member or friend or shelter, etc. Just because they want an ID NOW, doesn't mean the state is not doing their best. This is what the Michigan GOP and Schuette want here. Their goal is to figure out how to limit voting to only Republican leaning people. So not giving a person an ID with any name they request without any corroborating verification is a Republican conspiracy? Hmmm. To think some people also believe ID theft is really a thing? Yes it is repub politics. Michigan's requirements to issue a state ID have been sufficiently lax that our ordinary (non-enhanced) ID/driver's license soon won't be accepted as sufficient for air travel or to enter Federal buildings under the Real ID Act that was passed due to the terrorist attacks on 9/11. I keeping hearing excuses being made for people who have no identification. This is not the 19th century. Social service agencies and government agencies are available to assist people in acquiring identification. Many of these people seem to be inept. I live in Rochester Hiils and must produce my driver's licence at the voting booth. I have no problem with that. The election workers do not know me. Often it is the cost of getting documents that is a barrier. How many poor or homeless have money for a passport or birth certificate? If you are homeless you don't have a utility bill. Yes, ID is important, but let's not make it next to impossible for some to get. To have an acceptable I D is a personal responsibility for all. Few excuses except those not mentally able. The majority goes through the process. 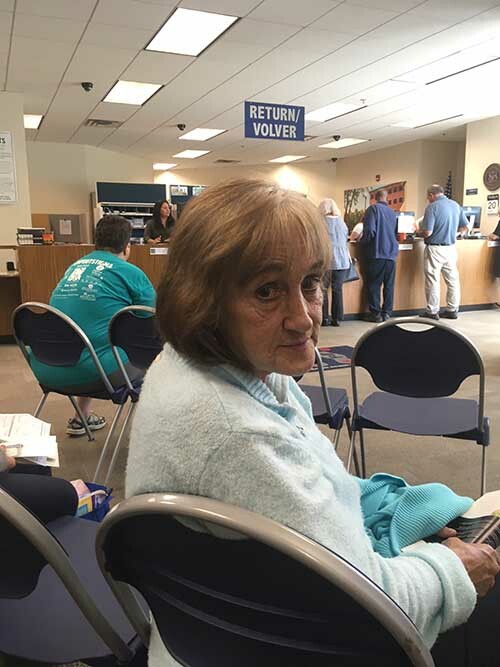 Perhaps the federal government should issue photo ID's at social security offices for all those receiving Medicare, Medicaid, etc benefits to help with benefits fraud. I want to be sympathetic, I really do, but honestly, I just don't understand how a person doesn't have a birth certificate, or a school diploma, or a draft registration card (if male), or school records, or a W-2, or utility bill stub, or lease/rental record of some kind, or a library card, a church tithe card, a letter of recommendation or at least one addressed to you, something. How is it possible to exist in this world without having access to some sort of paper trail of documentation? I mean, don't you need some basic level of competence in this area just to stay alive? If your house burned down right now and you had left your wallet/purse there, would you have any documentation left proving your identity? I would remember where I was born and write that place and ask for a copy of the birth certificate. I have the SS # memorized. All I would have to do it ask for a copy of it to show. You must realize that there are people who because of addiction or mental or physical stress just do not care about keeping up with their 'things'. They lose them or like you said have them stolen. Well, if this is important, they can remember who they are or get some help (Do they have friends or relatives?) This is not the big problem you make it out to be. The problem is that theses people have withdrawn from contact with others.